Get ready for Android Auto to hit the masses. Until now, the only way to get the Google-powered car interface was to install an aftermarket unit from Pioneer, and even those have only been around since March (Parrot is also citing support for Android Auto in its head units, but its availability has not been announced). But that changes today, as Android Auto is now finally available in actual cars that you can buy. That is, if you want to buy a Hyundai. The Korean automaker is the first car company to have Android Auto integrated in its production vehicles, starting with the 2015 Sonata with Navigation models. I recently spent a week with a 2015 Hyundai Sonata Sport 2.0T, and while I think Android Auto still has some growing up to do, I was overall very pleased. 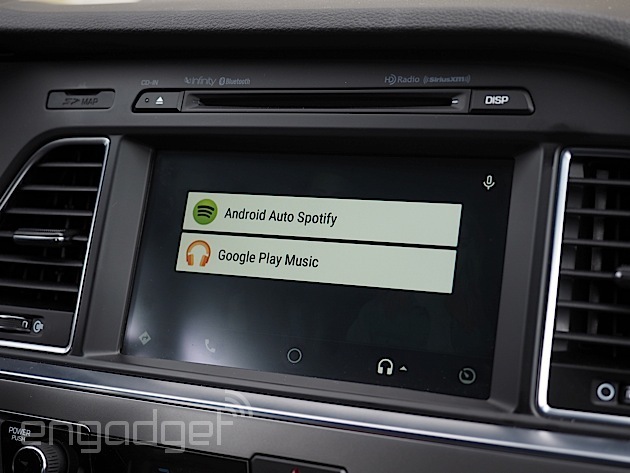 First, a brief primer on Android Auto. It's essentially a driver-friendly Android interface for your car. "We lock out the phone to make you look at the car screen. It's a lot safer," says Andrew Brenner, the lead product manager for Android Auto. Brenner is also the first person Google hired to lead the project two years ago. "The first thing we did [when we started the project] was to put cameras in the cars of Googlers and observe them," says Brenner. "What we saw shocked us and made us a little scared!" The team found that research participants frequently used their phones while driving, which Brenner says is unfortunately not uncommon. According to a study by the National Highway Traffic Safety Administration, approximately 660,000 drivers are "using cellphones or manipulating electronic devices while driving," and apparently that number hasn't changed much since 2010. People don't just use their phones for navigation either. Google found that drivers frequently used their devices for calls, messages, music and even things they really shouldn't be doing, like reading tweets. "Our digital life is so important these days. ... People don't want to leave their connectivity and link to the outside world when they get in the car," explains Brenner. It became immediately obvious that distracted driving was the main thing that Brenner and his team needed to solve. They started working with auto manufacturers -- Hyundai being one of them -- to develop an ecosystem that would allow an Android phone to integrate with the car's existing controls. With some cars, you might navigate the interface with knobs and buttons, while on others, you just use the touchscreen. The Sonata I tested falls into the latter category, with a touchscreen dominating the center console. It comes with Hyundai's own navigation and entertainment interface, with SiriusXM, its own GPS navigation system and an SD card preloaded with maps. But if you wanted to use Android Auto instead, now you can. Do note, however, that Android Auto only works with a Lollipop-powered Android phone (that's Android 5.0 and up). Fortunately, I happened to have a HTC One M9 on hand that meets that requirement. I plugged the phone into the car's center console via a USB cable, which then prompted it to download and install the Android Auto app. After I did that, I noticed a new "Android Auto" button appear on the screen. I tapped it and voila -- that Hyundai interface was gone. In its place was the Android Auto interface, which is so much cleaner and tidier than Hyundai's own cluttered UI that I couldn't help but smile when I first saw it. Interestingly, however, it wasn't a complete takeover. For example, I could still hear SiriusXM while I was fiddling with the Android Auto interface and similarly, I could keep streaming Google Play Music while over on the Hyundai side. Now, the Android Auto interface isn't an exact replica of your phone -- you won't see all your apps on here. That's because it's meant to surface apps and features that are relevant when you're on the road. The first thing that you see when you launch Android Auto, for starters, is an overview screen that's essentially a car-friendly version of Google Now. "It filters through only the cards that are relevant when driving," says Brenner. In my case, I often saw the currently playing track, recently missed calls, the local weather and directions to either go home or to the office. It also showed me directions to locations of upcoming appointments. I had booked a ticket to a local production of Book of Mormon, for example, and Android Auto instinctively knew to offer me directions to the theater. Creepy, but useful. Along the bottom of the screen is a universal nav bar that leads to maps and navigation, the phone dialer, music apps and an app tray. In Hyundai's case, the latter simply leads back to the default car menu. Aside from these features, Android Auto also supports basic Google voice actions. So, for example, you can say things like, "What's my next appointment?" or, "What's the weather today?" 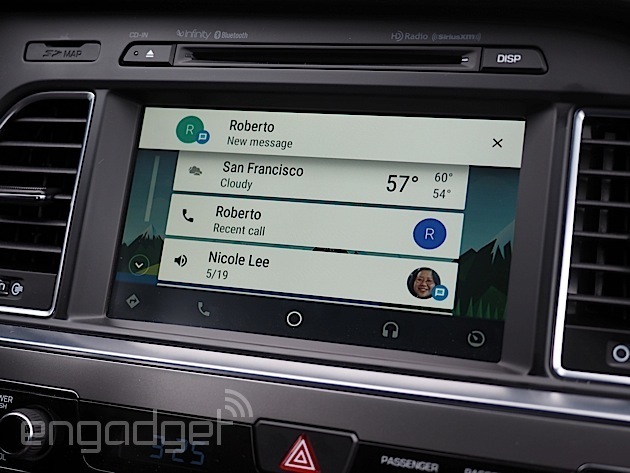 and Android Auto will respond with the appropriate answers just like your phone would. Indeed, Android Auto is very voice-driven. In the case of the Sonata, I pressed and held down the voice-command button on the steering wheel to activate the microphone (though simply tapping the microphone on the screen would work too). From there you can say all kinds of commands, like "How did the Warriors do last night?" and, "Find me some coffee." In the first case, you'll hear a voice telling you the scores, while the latter command will bring up a list of nearby coffee shops. Tap a spot you want to go to, and Android Auto will navigate you there. In my experience, voice controls worked great. Unlike a lot of car systems where you have to go through a tree of commands to do anything, I could just speak naturally. In my own 2012 Ford Focus, for example, I have to say, "Destination, Street Address," before detailing exactly where I want to go. With Android Auto, I could just say, "Take me to In-N-Out," and it'll just show me the way to the closest In-N-Out. I could also say commands like, "Call Roberto," or, "Text Michael," for calls and text messages and "Play [insert name of artist or song]" for music. In fact, I can even specify the exact app. With music, for example, the default is Google Play Music, but Android Auto works with other music services like Spotify, TuneIn and iHeartRadio. So I could say, "Play Vampire Weekend on Spotify," and it'll know to switch over to the different app to play the song. The look of Android Auto is also designed to be very car-friendly. The fonts are nice and big and the UI is meant to be easy to navigate. Google Maps on Android Auto, for example, has fewer location labels than its mobile counterpart. When I get an incoming text message, I see a notification pop up on the screen showing who sent it, but not the actual message itself. Instead, I have to press the voice button to prompt Android Auto to read it to me. The menu system of each app is also simplified and standardized, while maintaining a few individual characteristics. So, for instance, both Google Play Music and Spotify have the same play/pause and track controls, but the former is orange while the latter is green. The apps also have different menu options depending on their features. That's not to say I didn't encounter a few bugs. Whenever I requested Android Auto to play a song, it struggled to show me the relevant track information on the screen -- it would show "Getting your selection" instead of the name of the song. Additionally, the current Android Auto app library is still relatively small. While I appreciate that it supports WhatsApp and Skype as alternate messaging services, I wish that it could also support Twitter DM, which I use a lot more often (Ed correction: I had originally said it doesn't support Google Hangouts, but it does). The same goes for music -- I wish it supported Rdio and SoundCloud as well. Still, these are mostly teething problems, and I suspect Android Auto's performance and app library will improve over time. So if you're Hyundai, why would you agree to offer Android Auto if you've already invested time and money in your own in-car solution? Cason Grover, Hyundai's senior group manager for Cross-Carline Planning, says it's all about freedom of choice. "Right now if you want onboard maps, you have to use this SD card. ... That's good technology right now, but over time, mapping will become more and more offboard," he says, pointing to Google's ability to have real-time traffic info. But when it comes to driving in areas where you might not get great data reception, automotive GPS will still be useful. Brenner says that Android Auto also isn't meant to take over your car's internal system like heating and seat suspension. But it's clear that carmakers like Hyundai see the benefit of partnering up with the likes of Google and Apple -- Hyundai's 2015 Sonatas with Navigation will also be compatible with Apple CarPlay down the road -- if only to make their vehicles more appealing to smartphone-savvy consumers. "We've learned quickly that to offer everything that everybody wants is not feasible, more so with apps on the phone," says Grover. 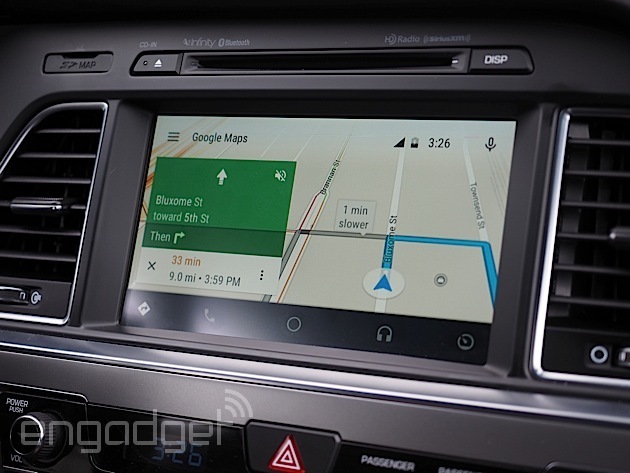 "Google works with those developers, and those apps work with every Android Auto phone. All we have to do is work with Google to integrate it with the car." To drive home the point, Hyundai is also planning on rolling out cars with a new head unit called Display Audio. It has a center console touchscreen like the Navigation models except that it won't come with embedded maps -- you'll have to supply your own. Not only does this make the cars a lot more affordable to the average consumer, but also it's when third-party solutions like Android Auto and Apple CarPlay really come into their own. "Right now only less than half of all Sonatas have support for Android Auto," says Grover, explaining that's because the Navigation models are mid- to high-level options. But once Hyundai rolls out those cars with Display Audio units, nearly all of Hyundai's fleet will be Android Auto-ready. "Android Auto is focused on trying to have you use your phone in a much safer way," says Brenner. "We want to give people the connected experience that they crave." If you're ready to take the Android Auto plunge now, however, well you can always head on over to your closest Hyundai dealership to check out the new Sonatas with Navigation. If you're already a current owner of a 2015 Sonata with Navigation, you'll be able to take your car down to a dealer where you can update your car's software with Android Auto. You could also add an aftermarket unit from the likes of Pioneer or Parrot if you'd rather not give up your existing car. And, of course, you could also just wait for more automakers like Honda, Ford and Audi to roll out their own Android Auto-compatible vehicles later this year.